Days of Our Lives (DOOL) spoilers tease that stunning murder is coming up in Salem. One DOOL character will bite the dust, so everyone’s speculating on who the victim might be. However, there’s another important puzzle piece to consider. Since a murder is on the way, who will be revealed as the killer? After this shocking slaying, there’ll be plenty of suspicions about the person who committed the crime. Many suspects will emerge, so it’s too early to declare any particular Salemite guilty. Days has to kick off this story before any big clues come out. Nevertheless, we should probably go ahead and put one character on the suspect list. Days of Our Lives spoilers state that Stefan O. DiMera (Tyler Christopher) will make some bad first impressions in town. As Stefano’s (Joseph Mascolo) long-lost son, he certainly won’t get along with his new family members. Stefan will have a strong personality and quite an ego. It’s easy to imagine him causing trouble outside of the DiMera bubble as well. That’s especially true if Stefan sparks some corporate wars. It may not be long until all of Salem hates this guy. Days spoilers say Stefan will face an uphill battle since he’s Stefano’s offspring. Stefan’s devious ties could make him a top suspect in the murder investigation. After all, the timing should raise some red flags. Someone will turn up dead not too long after Stefan arrives. The Salem P.D. may not believe that’s a coincidence. Hope (Kristian Alfonso) and Rafe (Galen Gering) will have to take a closer look at Stefan’s hidden agenda. 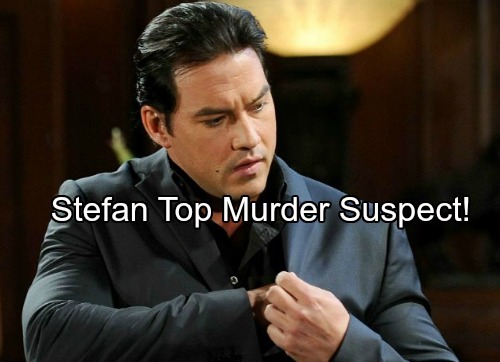 If Stefan is indeed revealed as the murderer, that might be a smart move on DOOL’s part. We need a DiMera who’s not a softie or a joke. Chad’s (Billy Flynn) the moral compass of the family and Andre (Thaao Penghlis) provides the comic relief now. Stefan could emerge as the crafty, darker brother. He could be a lot like Stefano and that would be great news for the DiMera clan’s future. Stefan might be able to get away with his crime. If there’s no real proof, Stefan could get off scot-free and earn his spot as sinister DiMera royalty. Are you hoping Stefan is at least a little evil? We’ll give you updates as other Days of Our Lives details come in. Stay tuned to the NBC soap and don’t forget to check CDL often for the latest Days of Our Lives spoilers, updates and news.